Due to Kiwanis tomorrow, any grade 6 students that ordered hot lunch will receive theirs on Thursday at the canteen. Thanks again to our amazing hot lunch ladies for making sure everyone gets what they’ve ordered!! We welcome students of all faiths who desire a Catholic Education. 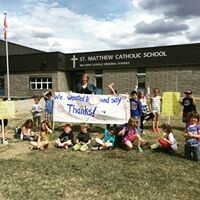 St. Matthew Catholic School is a Pre-Kindergarten to Grade 8 publicly funded school located in Rocky Mountain House, Alberta, proudly welcoming children of all faiths desiring a Catholic education. With a Gospel view of life, students are called to grow spiritually, academically, socially, culturally and physically. Our Catholic faith is nurtured and experienced in all classes, celebrations, and prayer. To find out why St. Matthew Catholic School is right for you, please visit us. Congratulations To Our Grade 5/6 Poster Contest WINNER!!!! Congratulations to Jan Brianna Gelvezon from Mrs. Orcutt and Mrs. Turnbull's grade 5 class for winning the CWL poster contest! Beautiful artwork! Today is the last day for ski trip deposit. After 3:20 pm today, numbers will be sent to the ski hill and no deposits will be accepted. Thank you. We now begin the season of Easter! We wish you and your family a wonderful and blessed Easter! Through this Easter season may the love of the resurrected Lord, Jesus Christ help us discover God's saving and sustaining grace.